Let's grow this list even more! 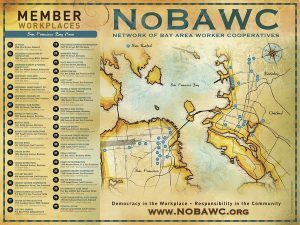 Below is a list of cooperatives and collectives in the Bay Area. If you are part of a cooperative that is not included on this list, please let us know! 924 Gilman Street Collective – Punk rock collective and venue. Adobe Books and Arts Cooperative – Bookstore /art gallery that has community events. In Mission for 27 years/ 2 years as coop. AK Press – Distributor of radical and independent books, pamphlets, magazines, CDs tapes, t-shirts, stickers, and other merchandise. Alvarado Street Bakery – Certified supplier of whole grain breads, bagels and more. Arizmendi Bakery – Located in the Inner Sunset District of San Francisco. Bakery and pizzeria specializing in bread, pizza and pastries. Arizmendi Bakery – Located in Oakland. Bakery and pizzeria specializing in bread, pizza and pastries. Arizmendi Bakery – Located in Emeryville. Bakery and pizzeria specializing in bread, pizza and pastries. Arizmendi Bakery – Located in the Mission District of San Francisco. Bakery and pizzeria specializing in bread, pizza and pastries. Arizmendi Bakery – Located in San Rafael. Bakery and pizzeria specializing in bread, pizza and pastries. Arizmendi Association of Cooperatives – Cooperative made up of seven member businesses: six cooperative bakeries and a development and support collective. Artist’s Television Access (ATA) – Non-profit, artist-managed collective media art center that offers instruction and access to film, computer and video editing facilities. Berkeley Free Clinic – Follows a client-centered philosophy and offers: basic dental care, acute primary medical care, HIV testing and counseling, sexually-transmitted disease treatment, men’s sexually-transmitted disease screening, peer counseling and information & referral services. BioFuel Oasis – Women-owned and specializing in bio-diesel from waste oil purchased from California plants. With an urban farming supply store on site. Bound Together Bookstore – Anarchist bookstore featuring radical literature and events. Box Dog Bikes – Bicycles and bike repairs in the Mission District. Cheese Board Collective – Cheese store and pizzeria as well as a bakery serving morning coffee and pastries. City Art Cooperative Gallery – Art gallery run and maintained by 200 local artists. Community Printers, Inc – Established in 1977, Community Printers serves a wide range of business, educational, governmental and nonprofit organizations with high quality commercial printing. Cooperative Digital – Information Design. Copwatch – Grassroots all-volunteer organization which works to defend the right of victims and survivors of police brutality to fair treatment under the law; provides legal referrals and assistance with filing Police Review Commission complaints. Co-Soap / Two Oaks Cooperative – Manufactures 100% vegan soaps from olive, coconut and avocado oils. Crestmont School – K-5 collectively-run elementary school in Richmond. Cupid Courier – Green courier service for the greater Bay Area. Design Action Collective – Provides graphics and communication services to social justice organizations. DIG Cooperative – Ecological community development firm based in Oakland. Eco Care House Cleaning c/o WAGES – Women-owned, environmentally sound house cleaning from South San Jose to Gilroy. Ecology Center of San Francisco – Non-profit cooperative that provides resources and education to create sustainable and regenerative communities in San Francisco. Electric Embers – Internet hosting for progressive non-profits, activists, artists and cooperatives. Emma’s Eco-clean c/o WAGES – Environmentally sound house cleaning based in Redwood City. Fusion Latina Restaurant – Woman-run, cooperative restaurant in Richmond, CA offering traditional, organic food from Mexico and Nicaragua. Hasta Muerte Coffee – Is a new, poc collectively run, worker-owned coffee shop. We are committed to nurturing community while serving the best coffee, hasta la muerte. Offering drinks and snacks and hosting a specialty bookstore, we hope to provide a warm and inclusive atmosphere for friends and neighbors to gather. We believe in non-hierarchical work spaces, quality coffee, and community building. Heartwood Cooperative Woodshop – Artisan cooperative providing shop space and use of woodworking machinery to woodworkers. Home Green Home c/o WAGES – Natural cleaning cooperative founded in partnership with WAGES and Seventh Generation. Local Flavor Catering – Serving delicious, locally sourced food to the Bay Area since 2003, converting to a worker-owned cooperative in 2013. Loconomics – Is a freelancer and worker-owned cooperative. They are part of a growing movement called “Platform Cooperativism.” Loconomics is an on-demand marketplace for clients to book local services and gives service professionals the tools and technology needed to run their own business. Long Haul/Infoshop – An activist resource center, political reading room/storefront, and community space. Mandela Foods Cooperative – Grocery store and nutrition education center located in West Oakland. Maybeck High School – Staff-run high school in Berkeley. Missing Link Bicycle Cooperative – Sells new and used bicycles, repairs bikes and bike rentals since 1973. Modern Times Bookstore – Neighborhood bookstore and progressive resource for the Bay Area. Nabolom Bakery – Worker-owned collective bakery and cafe established in 1976. Natural Home Cleaning c/o WAGES – Green home cleaning for Berkeley, Oakland and the East Bay. Other Avenues – Food store since 1974 in the Outer Sunset specializing in bulk foods, organic foods and environmentally friendly cleaning products. Pedal Express – Non-motorized cargo delivery service in the Bay Area providing regularly scheduled route service. Quilted – Strategic consulting, graphic design, web development to progressive arts, education and non-profit organizations. Radical Designs – Websites and custom software. Rhizome Urban Garden Cooperative – Install and maintains organic permaculture-based gardens and landscapes. San Francisco Mime Troupe – Creating and producing socially relevant theater of the highest professional quality and performing it before the widest possible audience. Suigetsukan Martial Arts School – Collectively run martial arts school specializing in Jujitsu, Aikido and Japanese swordsmanship. TechCollective – Information Technology firm specializing in open-source, affordable IT support for non-profits, small businesses and low-income individuals. The Girl Army – Women’s self-defense collective established in 1994 at the Suigetsukan Dojo. The Juice Bar Collective – Offers a variety of prepared foods and freshly squeezed juices; primarily take-out. Women’s Action to Gain Economic Security/WAGES – Provides training for low-income women.